Two weekends ago, my little sister graduated from high school. I am so proud of her, and it was really fun to be there as she turned her tassel and threw her cap in celebration. 4 years down, 4 more to go! She is going to Georgia College and State University in August, and I just know that college is going to change her life. This past Tuesday was my dad's 53rd birthday, and I was so excited to make breakfast for him. I wanted him to feel extra special since I was leaving to go to CAMP with Watkinsville First Baptist's youth group that morning. CAMP was in a word, amazing. We were at Horn's Creek Resort in Ocoee, TN from Tuesday to Saturday. The whole theme was Get It!, and Joel, our youth minister, had been getting everyone pumped up as they tried to figure out what IT was. IT turned out to be confidence in Christ, and we read the book of Philippians over the course of our 4 days together. God truly moved in the hearts of everyone who was there. It was such a joy to sit under Pastor Carlos' teaching twice each day and to be able to discuss all that the Lord was showing us through His word. My friend Brittany and I got to be with the same 7th grade girls we have taught in small group this year, and that was wonderful. It was such a joy and a privilege to see the Lord use His word to stir their hearts and hear their testimonies. They all got so excited about diving into the Word and opened up to one another, and it was truly beautiful. However, everything came back to this one point: A life of humble confidence in Christ will lead to radical obedience to Him. Not to mention the wonderful rec time we had... paintball, water park complete with water slide, wave pool, and lazy river; zip line, giant swing, rock wall, lake with the BLOB and canoes and rafts...we played hard. We also got great at running away from a cute little mouse in our cabin who wanted some of our girls' snacks that were everywhere. Now that I am at home again, I am trying to establish some kind of routine or structure for myself each day. I have been living the lazy post-grad life for about a month now, and it is getting kind of old. I can't focus on circumstances or situations that the enemy tries to throw my way to knock the wind out of my sails. My confidence must be in Christ alone. He is all I need! It is so easy to get frustrated with the little things and think about how the Lord is literally going to have to supernaturally provide in order for me to be in Mexico in 2 short months. When I think of all I need and how much I still lack in order to make this leap of faith, it seems ridiculously impossible. But we serve a God who can make something out of nothing. He makes all things new, and He works for the good of those who love Him. Yesterday I went for a run and got caught in a thunderstorm. Words cannot do justice to how good it felt to feel the rain on my skin and just welcome the cool relief. I used to hate rain, but now I love it. Why not welcome the storms of life and learn to rest in the Savior? He made the storms, after all. I heard this song 4 years ago at a BCM service, and now thanks to grooveshark.com, I found it again!!! I have been looking high and low. The lyrics definitely describe my current state of mind- to choose Christ instead of this world. I bow down, I bow down to You. 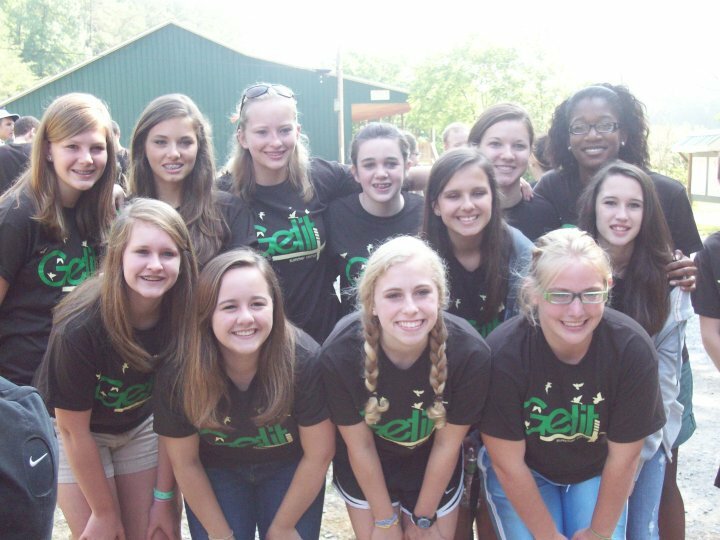 And here are my lovely ladies on our last day of CAMP! Aren't they all just gorgeous? !